Following 8 years of conflict between the Nigerian Government and Armed Opposition Groups (AOGs) in north-eastern Nigeria, the region has seen significant levels of destroyed infrastructure, a dramatic erosion of livelihoods and the displacement of over 2 million people at the height of the conflict. The entire population in the region is extremely vulnerable and in need of basic humanitarian support, with Borno State hosting over 1.3 million of Internally Displaced Persons (IDPs). Since 2014, improved security in some areas has led to an estimated 1.3 million returnees to areas of origin, however in the last several months an increase in hostilities between AOGs and the Multi-National Joint Task Force (MJTF) has contributed to new displacements throughout Borno State. Humanitarian access due to insecurity has consistently been a major challenge in northeast Nigeria, limiting humanitarian actors’ capacity to assist populations in hard to reach areas, residing outside of major local government area (LGA) towns. Consequently, a key challenge is gaining timely information for humanitarian actors to plan and implement life-saving interventions. In an effort to bridge this gap, REACH is conducting assessments in sites seeing high levels of displacement, providing an understanding of displacement trends and routes, movement intentions, conditions and needs of people remaining in hard to reach areas. Due to the limited accessibility of such areas, REACH is conducting focus group discussions and key informant interviews with new IDP arrivals, commercial drivers and traders, having direct access and recent information about these areas. REACH Displacement Assessments have been conducted so far in Guzamala, Gwoza, Marte, Monguno and Nganzai LGAs of Borno State. In Gwoza, REACH identified trapped populations in surrounding areas with intentions to leave in the near future. These people were facing severe protection concerns and movement restrictions due to insecurity, and had limited access to their normal livelihoods and humanitarian services. Assessments focusing on Nganzai LGA were able to describe the widespread geographic areas affected by recent displacements, as well as the shared narrative of many recently displaced community members who have experienced long-standing harassment and attacks by AOGs in their home villages. Major shelter concerns in areas of origin were highlighted as homes were often burnt down in AOG attacks. Results from focus groups with recent IDPs in Marte and Monguno gave insight into the movement triggers of those living within the Lake Chad area north of Marte, and the harsh conditions and lack of assistance along their displacement route. Interviews conducted with informants who have direct access to areas in Guzamala – which are inaccessible to international non-governmental organisations – provided insight into the needs and intentions of those still living in these difficult situations, and will help the humanitarian community plan their forthcoming response as the prospects improve for increased access to these areas. Overall, these assessments provide crucial information to aid actors on whether future displacement from surrounding areas should or should not be expected, on the general displacement routes and conditions faced by IDPs in their areas of origin. 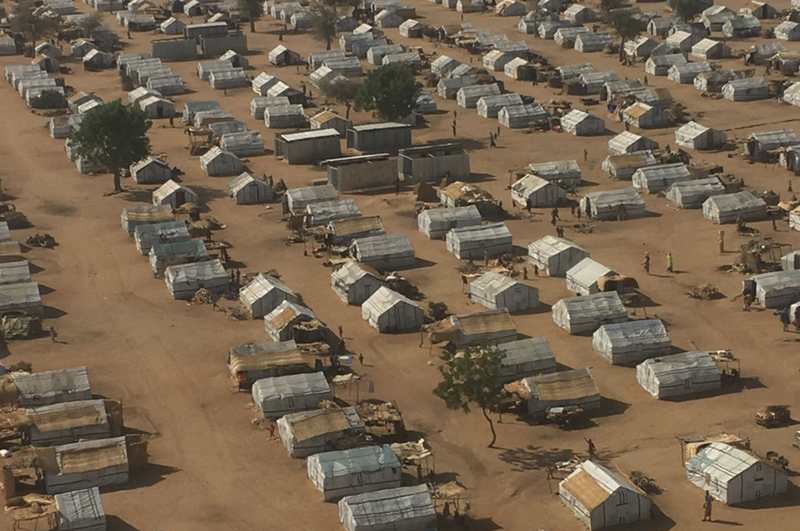 As new displacements are constantly occurring in northeast Nigeria, REACH will continue conducting these assessments to support preparedness and response efforts of humanitarian actors. Please find here the Displacement Assessments of Guzamala, Gwoza, Marte, Monguno and Nganzai LGAs of Borno State.